Last Flag Flying is a loving salute to the enduring nature of honor. Thoughtful and sometimes genuinely moving, it’s also not above getting laughs from three aging veterans trying to buy their very first mobile phones or arguing about the ethnicity of Eminem. It is 2003, and Larry, aka “Doc,” (Steve Carell) is looking up two old Marine buddies for a very specific purpose. Doc, Sal (Bryan Cranston) and Richard (Laurence Fishburne) all served in Vietnam together, and now Doc needs his friends to help bury his son, who has just been killed in the Iraq War. Once the men learn that the official story of the boy’s death isn’t exactly the real story, Doc declines a burial at Arlington, deciding to transport the body for a hometown funeral in New Hampshire. Older gentlemen out for a wacky road trip? Is that what’s going on here? Those fears are understandable but unwarranted, as director Richard Linklater confidently guides the film with gentle restraint and his usual solid instincts for organic storytelling. Some good-natured humor is framed from the three outstanding main performances, but it never derails the resonance of these characters grappling with the cyclical nature of sacrifice. Linklater adapts the script with source novelist Darryl Ponicsan, who also wrote the 1970s servicemen-centered flicks Cinderella Liberty and The Last Detail. Last Flag Flying draws many parallels with the latter film, as it is not a stretch to see these characters as the Detail men taking stock of what the years have changed – and what they haven’t. Though the perfectly-drawn contrasts of the three personalities seem manufactured at times, it matters less thanks to Carell, Cranston and Fishburne, who are never less than a joy to watch. 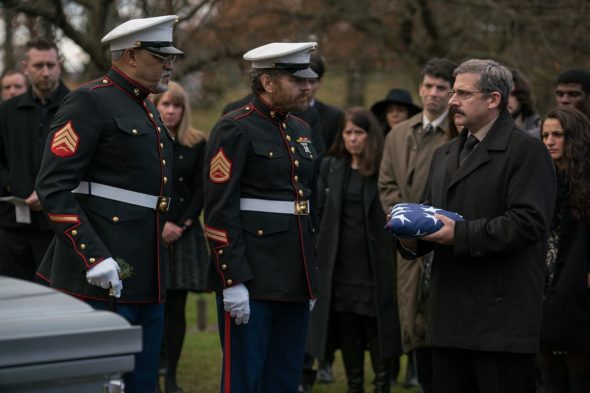 You’ll need tissues handy for the touching final moments, but Last Flag Flying makes the tears, and the trip, worthwhile.